Liberty is proud to announce Dan Izzo as one of Consulting Magazine's "Top 35 under 35" for the category of Excellence in Operations Management. CHICAGO, April 23, 2018 – ALM’s Consulting magazine unveiled its 2017 Rising Stars of the Profession, an annual list honoring 35 young up-and-comers in the consulting profession under the age of 35. 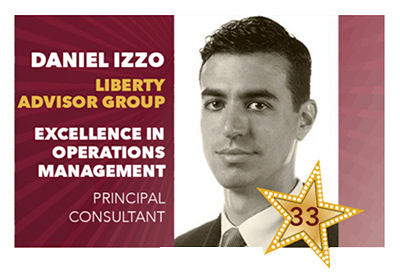 Liberty Advisor Group is proud to announce that Daniel Izzo, a Principal at the firm was nominated for Excellence in Operations Management. Honorees were recognized at an awards dinner and are featured in the March issue of ALM’s Consulting magazine.